The Rita Nitz Story: A Life Without Parole is an in-depth personal investigation into Miley’s murder, for which Rita Nitz was sentenced as an accomplice to life in prison. Born in 1959, Rita was thirty when she was sentenced in 1989. Her husband, Richard Nitz, was convicted of the murder. Detailing the crime and its aftermath, Larry L. Franklin uncovers a disturbing set of facts that illuminate a possible miscarriage of justice. Was Rita Nitz involved in the murder of Michael Miley? Franklin doesn’t purport her guilt or her innocence but instead details the plight of a troubled woman who was a victim of sexual abuse and domestic violence at the hands of family members and spouses and who may also have been a victim of inadequate legal representation and a judicial system more interested in delivering the maximal punishment than in serving justice. In a journey that included consultations with experts in prosecutorial conduct, jury psychology, and forensic evidence, Franklin discovered details that were withheld from the jury and the public during the trial in 1989. Drawing on numerous conversations with Rita at the Dwight Correctional Center in Illinois, Franklin divulges the story of Rita’s tumultuous youth and her three problematic marriages. He shows her to be a battered woman who didn’t fully understand the circumstances and behavior that led to her being implicated in such a hideous crime and who lacked the financial resources and emotional strength to navigate the legal tangle that entrapped her. Franklin thoroughly examines the fifteen-day trial that led to the conviction of Rita Nitz. Using the trial transcript, he reconstructs the testimony of key witnesses, the actions and reactions of the judge and jury, and the inadequate defense that left jury members speculating whether the verdict might have been different if the attorneys had been reversed. He also suggests other theories and names possible perpetrators involved in the murder that further imply shoddy police work and a tainted criminal investigation. 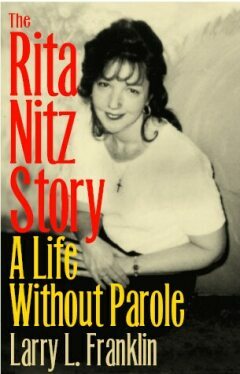 The Rita Nitz Story: A Life Without Parole illustrates that Rita’s conviction was largely due to spurious testimony and woefully inadequate legal counsel and did not rely on any forensic evidence to support the charges. Franklin also points out the disparity in justice between Rita and Richard, who is up for parole in less than twenty years, while Rita remains sentenced to life without parole. In attempting to reach the truth about Miley’s murder, Franklin highlights abuses in the Illinois correctional system and disparities between the treatment of male and female convicts, sketching a blueprint that could improve law enforcement and justice in rural Illinois. The volume includes a gallery of nine photographs.